Fun Fact #1: This was Streep's first leading role. Fun Fact #2: In the film, Sarah (Streep's character) is an artist, and is often shown drawing portraits. 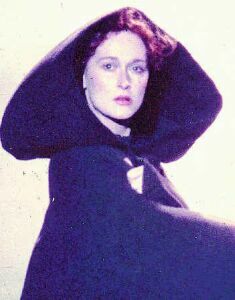 Streep herself is a talented artist, having studied costume design in college. Fun Fact #3: 1981 was the only year in history when Streep was up against Katharine Hepburn for an oscar (it was Streep's first Best Actress nomination, and Hepburn's last). Streep ultimately lost to Hepburn's performance in On Golden Pond, but would win the oscar the following year for Sophie's Choice. 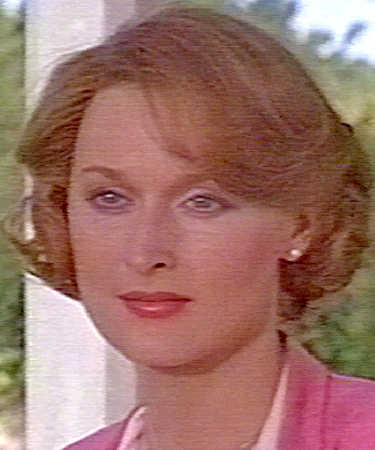 The many faces of Meryl: Streep has a dual role of sorts here, playing both Sarah (left), the film's titular love interest, and Anna (right), an actress portraying Sarah. Film Review: I found this film solid, but not spectacular. It's the kind of film where there are a lot of standout elements even though the whole isn't really a standout film (at least for me). 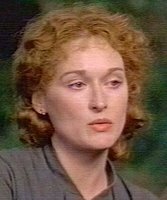 Streep, of course, is fabulous, playing Anna, an actress who's appearing in a film version of The French Lieutenant's Woman. In the film-within-a-film, Anna plays Sarah Woodruff, a mysterious woman who haunts the seaside waiting for her French lieutenant lover who abandoned her long ago. Sarah's beauty and mystery bewitch Charles, an English scientist recently engaged to be married to a woman of high social stature. Charles is played by an actor named Michael, who is in turn played by Jeremy Irons. The two actors, Mike and Anna, have a love affair offscreen that parallels the romance of their characters, and the film cuts back and forth (rather jarringly) between the "film" world and the "real" world. I love the premise here, and normally I would love this type of film, but on the whole, it just seemed, well, rather boring, and lacking in energy. Everything worked fine - the sets and costumes were lovely, the music was beautiful, the leads had good chemistry, it was well-written - but for me, it lacked that extra spark of greatness. I suppose this was the fault of the director, Karel Reisz; not that he did anything wrong, per se, but the type of film he made only has so much to offer (bonus points, though, for the gloriously "meta" opening titles sequence with a tracking shot of Streep set to the brilliant, dramatic score... and for the brilliant trailer, overflowing with the best kind of lush old-school romance, and fetishistic close-ups of Streep). 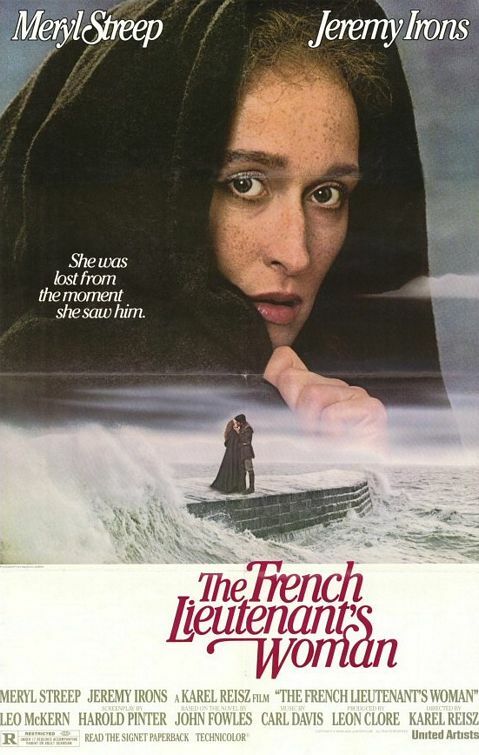 The French Lieutenant's Woman reminds me of Girl with a Pearl Earring in its depiction of a mysterious and desirable woman in a repressive society, and in how both films somehow add up to less than the sum of their parts. But regardless, a good film. Recommended. Streep Review: This was obviously Streep's first claim to fame as "the leading lady of American cinema," and it arrived just in time to start the 80's (the decade of Streep). She won the lion's share of best actress awards for 1981, even if she did lose the oscar. I personally don't feel that this is among Streep's best perfs (though it may have been her best work up to that point), but it was still a great performance (when is she NOT great?). Some critics have charged her of overacting in this film, but I disagree. The role of Sarah demands a degree of theatricality in order to contrast with the more naturalistic role of Anna, and I think Streep juggled the two quite well. Her English accent is perfect, of course, but more importantly, she nailed the mystery of Sarah - her eyes say so much with so little - and she brought some of that mystery, subtlely, back into Anna as well. A great performance... probably the best part of the film. Sounds interesting. The kind of thing I would love done properly. wow, I had no idea that's what the plot of the movie was. If you haven't seen Silkwood, you're in for a treat. Double the greatness, with Cher also being astonishingly great. I can't wait to hear your thoughts on that one.